Years ago I remember playing with my friend and her two little brothers teasing us while we tried to play dress up with our dolls! Well it’s now 2016 and one of her brothers is a dad of two little ones. 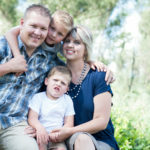 Chantelle asked me to do a family shoot with them. It was quite a difficult shoot! Eike was wade awake and we struggled to do lots of newborn photos with her. We end up doing more of a lifestyle shoot! And the fact that there is a toddler involved didn’t make my job easier! Can’t wait to take more photos of these two kids!